Lancaster City Council) from January 2016. The museum is supported by Lancaster City Council and Lancashire County Council. The past 12 months have been a period of uncertainty for the Museum. The financial issues facing Local Government are well known. Hence the City of Lancaster has put in place a review of the Museum Service with the aim of reducing overall costs. The outcome is awaited and expected in December 2016. The outcome is compounded by similar financial issues facing Lancashire County Council who have a Museums Service Partnership agreement with the City. The Regimental Collection has been located in the City Museum since the 1920’s at the invitation of the City of Lancaster. Although there are certain to be changes the Trustees are confident that the Regimental Museum will remain within Lancaster. We are fortunate to have the overall support of the City and the goodwill of Lancaster as a whole. Everyone recognises that the Museum is an important part of the heritage of North Lancashire and Cumbria. We await developments. Not with standing these issues it has been business as usual. Indeed much has happened. To mark the 100th Anniversary of the Somme a major exhibition entitled ‘141 Days: The Battle of Somme’ was mounted. The exhibition covered the whole of the ground floor of the City Museum and was well received. As at 28th October it has been attended by 19 112 visitors. Funding to meet costs was provided by the Sir John Fisher Foundation and the Army Museums Ogilby Trust. We are grateful to both charities for their support particularly the Sir John Fisher Foundation who also supported our 2014 Exhibition. The exhibition is ongoing and has been complimented by in house talks and visits by the Curator to schools and societies. Overall a triumph at a time of uncertainty with a major contribution from those behind the scenes who made it happen. January 2017 marks the 25th Anniversary of appointment of Peter Donnelly as the Curator of the Regimental Collection. Peter has made an enormous contribution to our affairs. He has seen changes, adapted to different initiatives, many of which never saw the light of day. He has been the ‘face’ of the Museum within the community and a font of knowledge about the Regiment. The latter is recognised well beyond the confines of Lancaster. Through his endeavours many new acquisitions have been added to the collection. He has loyally served the Museum and we hope there are many more years to come. Well done Peter! If we thought that 2015 may have been not so busy as it’s the second year of the Centenary of the Great War, we’d have been totally wrong! There remains great interest in the history of the Great War and all other aspects of both regimental and military history. Regimental history is of course not really about the regiment fighting in far off battlefields, it’s about the people of the regiment. It’s about local people who took part in national and international events, playing their part and “doing their bit” and of course generations on their relatives are fascinated to discover what part their own family had in the story of Great Britain. This report details just some of the activities undertaken by the museum – there is much ‘run of the mill’ day to day activity which keeps the museum running and the public happy. Answering enquiries remains an important part of the work, and it’s pleasing to know when those who have had an enquiry answered turn up to see the museum in person. The Curator remains a key part of the Lancaster City Museum team and he assists with activities both at the City Museum and in other parts of the County Museum Service, and beyond. The museum trustees met at the annual meeting in November. The trustees received a report on the present situation regarding the budget position of Lancashire County Council and were advised that a new staffing structure would be implemented based upon what the County announced in December. The Trustees started to review the Trust Document on which the museum is managed. A new document will be based upon the model deed of the Army Museums Ogilby Trust. Work has been underway on this with the Charity Commission. The Trustees discussed the appointment of an ex-officio trustee who would be the Armed Forces Champion of Lancaster City Council. This was agreed by the trustees and agreed by Lancaster City Council and Councillor Elizabeth Scott will be the representative. Major Daniel Parsonage represented the Chairman at the meetings of the Lancashire County Council and Lancaster City Council Museum Advisory Panel. The Museum holds full accreditation under the scheme operated by Arts Council England. The King’s Own Royal Regiment Museum provides a ‘living’ history of the character, activities, tradition and history of the British Army and in particular The King’s Own Royal Regiment, Lancaster. This is achieved through the preservation, interpretation and display of artefacts, archives etc for the purposes of historical research, information and education and the enjoyment of the general public. The King’s Own Royal Regiment Museum is committed to do what it can to reduce our impact on the environment. Where possible the museum uses recycled and recyclable materials. Great effort is made to reuse envelopes, for example, for both correspondence and sales, this also saves money. The donation to the museum of used padded envelopes may appear to be a very minor thing, but this has reduced the packing costs of museum sales items to almost nil. We re-use paper, use recycled paper and card and recycle also sorts of waste material from paper and cardboard to tin cans and glass. Public transport is used where possible. The work of the museum would not be possible but for the help and support of many people. Some people are very generous in their time and support. It would be impossible to acknowledge and thank everyone but some assistance is above and beyond and needs specific mention. Great appreciation goes (in no specific order) to Gaynor Greenwood, Fergus Read, Howard Martin, Pat Shackleton, David Shackleton, Anne Donnelly, Martin Evans, Jackie Britton, Paul Thompson, Graham Davis, Neil Barnett and Danny Parsonage for their continued support and assistance to the Curator. To those named and to many more – a big thank you for all your help, advice, assistance and encouragement. Three small exhibitions have been presented in this reporting period. The first covered the 1st/5th Battalion, King’s Own, in France and Belgium in 1915. The battalion arrived on the Western Front on 14th February 1915 and were quickly sent to Belgium where they were involved in notable actions in March through to May. The battalion was part of bitter fighting in the Ypres area around the 23rd and 24th April and then again in May at Frezenberg. These were the worst days of the entire war of the 1st/5th Battalion, and also for Lancaster and district, with the battalion almost totally made up of local people. We have a really good photographic collection relating to the 1st/5th Battalion in 1915 and many of these photos were used in the exhibition. Much of the focus of the Centenary of the First World War is of course aimed at the Western Front where the majority of fighting took place, however we did not forget the campaign in Salonika. Two battalions of the King’s Own, the 2nd and the 9th, served in Salonika from October 1915 to the end of the war. An exhibition using photographs, drawings and objects covered the two battalions in this less well known theatre of war. The photographs and sketches of Colonel John Bois and photographs of the padre, the Reverend Harley, have both been extensively featured. Moving away from the First World War the next exhibition tied in with the release of the brand new ‘Dad’s Army’ film. “Our Home Guard” used photographs, documents and objects to tell the story of the four battalions of the County of Lancaster Home Guard which were cap badged to the King’s Own. The curator gave illustrated talks connected to all three exhibitions in the museum itself and further talks as part of Lancaster University’s Campus in the City on the “Worst day of the war” on 23rd April. A second Home Guard talk was given prior to the screening at the Duke’s Cinema of the ‘Dad’s Army’ movie, which proved to be very popular. In November 2015 it became clear that the City Museum’s plans for the 2016 Summer exhibition had changed and there was a gap in the programme. It was decided that the two exhibition rooms would be handed over to the King’s Own Museum for a brand new exhibition ‘141 Days: The Battle of the Somme’. An application for grant funding to the Sir John Fisher Foundation was made, who had generously supported ‘War! 1914’. Work started on researching the exhibition and at the end of the reporting year fingers were crossed that the grant application would be successful as this would be the difference between a major exhibition or a low key one! The museum’s popular “Meet the First World War Soldier Character” sessions were held at various times through out the year, including Heritage Open Days. Sessions were also held outside the museum, including Lancaster University’s Campus in the City display. These sessions are popular and easy to run with limited cost. We have to report some challenges this year in keeping the collections safe and well. In mid-November 2015 there was water damage to the King’s Own costume store when rain overtopped a failed gutter in the roof. We were very lucky that despite a large amount of water passing through the room it missed all the uniforms. However four wardrobes have had to be re-located whilst work, which was added to the planned capital works, was completed. These capital works involve work on gutters and drain pipes. Sadly as part of this works water came into both the King’s Own gallery and the main store room. Fearing such a thing may happen during the works, all the collections had been temporarily relocated. The continued poor state of the roof of the King’s Own gallery is a concern and emergency repairs were carried out, and we are pleased to note that the replacement of the King’s Own roof is on the programme for capital works. We have to remain alert to the physical threats to the collections, both on display and in store. We welcome the City Council’s major Capital works programme for the entire City Museum building and hope that works are continued. We live in hard financial times and that is very clear when it comes to raising money for the museum. Donations have increased via the new donation box in the King’s Own gallery, but donations by post have declined. 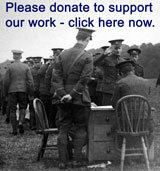 Donations are harder to extract from those which the museum correspondence with by email. The museum has failed in its regular donor scheme. The take up of the scheme has been very disappointing, and a re-launch with a new leaflet, saw the leaflets taken by visitors, but none completed and returned. The Curator was booked on a legacy giving course organised by the Army Museums Ogilby Trust, but sadly this course was cancelled at short notice due to a poor take up by others. It was hoped that attendance at this course would give guidance on a suitable leaflet and promotion of a scheme. The museum has received no bequests in the reporting year. A full financial report has been prepared and will be presented to the Trustees at their meeting in November 2016. For a period of time two website ran side by side, but all additions and revisions were being made only to the new website. After a couple of months it was decided to simply delete the old website and focus only on the new one. Within a short period of time it would appear that ‘Google’ and the other search engines had found the new site. The website continues to be a key method of delivery of information on the museum’s collections and the history of the regiment. It is suspected that there may have been some “over-reporting” of visitors to the old website and the figures for the new website are presented in a much more detailed daily basis, which appear to be more accurate. Photographs relating to Signaller Thomas Venterman 1930s-Second World War. Postcards sent home to Miss Christy Addison from soldiers in the First World War. Postcards and information on Private Tom Walton, 5th King’s Own. Photographs and information on Private Edward Wildman, 2nd King’s Own, Second World War. Material relating to Private Henry John Pidgeon, First World War. Material relating to Sergeant Danny Cross, King’s Own, Special Air Service and King’s Own Royal Border Regiment. Material relating to Lance Corporal Sidney Cartmell, 1st/5th King’s Own, First World War. Material relating to Colour Sergeant Albert Hawkins, King’s Own, 1920s-1940s. Photographs of Lance Corporal Charles Smith, 1957-1959. Material relating to Private Henry George Cook, 2nd King’s Own, 1934-1940. Photographs of Private Jack Ellel in Germany and Korea, 1953-55. Completed the transcripts of the letters of Lieutenant Colonel Charles Bevan, Peninsular War period. New acquisitions added throughout the website. Over 500 school children from a number of schools have learnt about the First World War through visiting the museum or a ‘meet the soldier’ session held at their school. There is a growing interest from primary schools in the First World War and many are more aware of local war memorials than ever before. It is good to hear of schools holding their own memorial services, but also visiting memorials. As already reported the curator gave some illustrated talks in connection with exhibitions held at the museum. Talks were also held off premises for other groups and societies. ‘On the War Path’ tours of Lancaster have been held in conjunction with a Lancaster Military Heritage Group Lottery Project run by Lancaster University. Handheld devices are used which can display photographs, archives and video media to support the talk given by the guide. Various Talks at the North Lancashire Branch of the Western Front Association. The museum continues to acquire some wonderful items, whether by gift or purchase they are all valuable additions to the museum’s collections. The Curator spends a lot of time checking internet auction sites, including ‘Ebay’ and is amazed at the range of material which continues to appear. Many photographs and postcards are purchased in this way, however with only limited funds the museum is sometimes outbid and misses out on interesting items. It is amazing to think that sometimes a century old photograph can sell for more than £200! Clearly the museum is not in this league to spend this much, but private collectors clearly are. By far the majority of the museum’s acquisitions through the year have been kindly donated by the soldiers or their families, or indeed others with no King’s Own connection, but just happen to have acquired something relevant to the regiment over the years. We continue to digitally copy and photograph items which are then added to the museum’s website. Sometimes a new acquisition can go ‘on-line’ within a few days of it arriving in the museum. This keeps things current and illustrates to the donors that their objects do serve a purpose telling part of the history of the regiment. Special mention must be made of a letter from Captain Jasper Hall, written before the Crimean War, in 1853, when stationed with the King’s Own in Edinburgh. This letter now joins a number of letters from Jasper Hall written to his sister and father from the Crimean War and acquired by the museum in 1976. An excellent find and addition to the museum’s collection. Material continues to be added to the collection, and positive efforts made to acquire more items, especially things not previously known about, which does still happen from time to time! KO3013 Various photographs, unknown individuals, groups etc; postcard and documents relating to Private Thomas Edward Stainton, 7th King’s Own; envelope addressed to Milner Helme, later commissioned in to the 5th Battalion, November 1914; Pen and ink sketch of an unidentified Captain of the King’s Own Royal Regiment, and his dog. Drawn by Private Robert Lyon, of ‘A’ Company, No. 12 Battalion, Royal Army Ordnance Corps, Old Dalby, Melton Mowbray; embroidered postcards, First World War; Large serving dish, “Presented to the Officers 1st Battalion, The King’s Own Royal Regiment by Captain Ralph Charles Matthews”; miniature oil painting, officer, 1816; cigarette card and other items purchased. KO3014 Album of photographs put together by Signaller T Venterman, 2nd Battalion, King’s Own Royal Regiment, ‘Views of Cairo, Sudan and types of Different Races” Dated 5 Sep 1930. Gift of Mr William F Dear, Newcastle upon Tyne. KO3015 Postcards sent to Miss Christy Addison, First World War, including some from soldiers of the King’s Own. Miss Christy Addison was the sister of nurse Miss Clemintine Addison, who served in France in the First World War, and died and is buried in Caton. Gift of Mrs Jaggard, Bury St. Edmunds. KO3016 1939-45 Star, Africa Star, Defence and War Medals to Private Edward Wildman, number 3714356, 2nd Battalion, King’s Own. Sweet heart badge, blazer badge and embroidered items sent home from Egypt, 1942. Photograph album. Gift of Mrs Susan Wildman, Penistone, Yorkshire. KO3017 Photo of the grave of Grave of Colonel Henry Moore, King’s Own Royal Regiment, Minehead Cemetery, Somerset. From digital image donated by Mr Biddle. KO3018 Digital copies of Postcards, photographs relating to Corporal Tom Watson, 5th King’s Own, First World War. From originals lent by Mrs Roper, Longridge, Preston. KO3019 Digital copies of photographs, documents, POW documents, etc relating Major E V Todd and Lieutenant T C V Todd, King’s Own. KO3020 Christmas cards, photographs, postcards, documents relating to Private Henry John Pidgeon, King’s Own, First World War. Gift of Mr Basil Pidgeon (son), Bideford, Devon. KO3022 Patriotic French Postcard, featuring French Soldier and Flag. Sent by Private W Hemsley, A Company, 1st/4th Battalion, King’s Own Royal Lancaster Regiment to Miss R Hemsley, 22 North Lonsdale Road, Ulverston, Lancashire. Postmarked 6 Aug 1915. Gift of Mr Andrew Brooks, Overtown, Cowan Bridge. KO3023 Photographs from digital copies relating to the service of Corporal Eric Bostock, 1st Battalion, King’s Own, 1958-59. Gift of Mr E Bostock, Morecambe. KO3024 Photographs from digital copies relating to Private Thomas Harold Edward Whitehead, 4th Battalion, First World War. Gift of Mr Michael Pearson, Huddersfield. KO3025 Suitcase, formerly the property of Private Henry Crook, 2nd Battalion, King’s Own, circa 1938-39. Photographs relating to the 2nd King’s Own, Palestine. Gift of Mr William Crook, Kelsale, Suffolk. KO3026 Allied Victory Medals to Private Thomas Willetts, 2nd/5th King’s Own, and Private John Albert Redhead, 8th King’s Own. Gift of Mr John Carruthers, Barrow-in-Furness. KO3027 Queen’s South Africa Medal, King’s South Africa Medal, 1914/15 Star, British War and Allied Victory Medals, Meritorious Service Medal to Sergeant Major Albert Crossley, King’s Own and Royal Army Medical Corps. Gift of Mrs Gilian Sephton, Aylesford, Kent. KO3028 Trench maps, small folder and note books, French and German POW Currency, relating to Captain A Holland, 8th King’s Own. Part of a larger collection sold. Purchased. KO3029 Photographs, documents relating to Private Fred Howarth, 1st/4th King’s own, First World War. Gift of Mr S R Gamble, Edinburgh. KO3031 Album of photographs relating to the service of an unidentified soldier who appears to have served with both the King’s Regiment and the King’s Own Royal Regiment in Hong Kong in 1954/56. Gift of Mr John Baker, Marton, Blackpool. KO3032 Photographs digitally copied from originals relating to the 1st King’s Own in Korea and service of Private Jack Ellel. Lent by Mr Jack Ellel to be copied. KO3033 Official illustrated wounded soldier discharge certificate to Lieutenant Richard Leslie Brown 1st Battalion King’s Own Royal Lancaster Regiment. With original card tube. Photograph and medal ribbons. Gift of Mr David Brooke, Claughton-on-Brock, Lanchashire. KO3034 Letter from Captain Jasper Hall to his sister Jane Hall, dated 19 Sep 1853, Edinburgh. Envelope addressed to Miss Jane Hall, Biebrich, sur le Rhin, Germany via Ostende. Article from The Times newspaper, circa Sep 1853 “Affray between the Military and Police in Edinburgh” with reference to Lieutenant Roberts of the King’s Own Royal Regiment. Purchased. KO3035 1914-15 Star, War and Victory Medals awarded to Private George Marshall, 8th King’s Own. Memorial Plaque, certificate, photographs. Gift of Mr Harold Hardman, St. Annes on Sea. KO3036 Photographs of graves of Private Thomas Lucas, 5th King’s Own and Private Cecil George Hiscock, 8th King’s Own, Cracow Rakowicki Cemetery, Poland. Gift of Mr Fergus Read, Cambridge. KO3037 Unidentified soldier of the King’s Own Royal Lancaster Regiment and his wife, circa First World War. Gift of Colonel Andrew Dennis, Lancaster. KO3038 Photographs of kit bags relating to two soldiers of the King’s Own who were in France in 1940, found in 1990s. From digital image supplied by Mr Vincent Tessier, France. KO3039 Photo, officers and soldiers of the Depot, King’s Own, 1932. Gift of Mrs Debbie Allan, Lancaster. KO3040 Book: Drill Halls, A National Overview, by Katie Carmichael. English Heritage (Historic England). Gift of Historic England. KO3041 Model of Saxon Armoured Personnel Carrier, formerly used in Army Recruiting Office displays. A vehicle used by the King’s Own Royal Border Regiment in places such as Northern Ireland, Cyprus and Iraq. Gift of Major Robert H Davison, Recruiting Officer, North West England, Duke of Lancaster’s Regiment. KO3042 Book: The Great Siege of Gibraltar 1779-1783. Keith Sheriff, Gibraltar Heritage Trust, 2015. Gift of Gibraltar Heritage Trust. KO3043 Scarlet tunic, trousers, sash, buff leather belt and hat of Sergeant John T Preston, 4th King’s Own. Purchased. KO3044 Suitcase, named to Private Edwin Crook, 1st King’s Own, 1950s, documents, photographs etc relating to his service in Hong Kong. Gift of Mrs Janet Coyle, Greenock, Scotland. KO3045 Photograph: Quartermaster’s Staff of the 2nd/5th Battalion, King’s Own Royal Lancaster Regiment, in France or Belgium, circa 1918. Gift of Mr Tim Cross, Tarporley, Cheshire. Enjoyed the museum as my uncle was in the First World War. Well worth a visit, I am visiting the Somme, France. My uncle died in July 1916, his name is on the Thiepval Memorial. Very interesting and informative. The curator gave his time and knowledge very kindly to further out family history research. Great – took notes about the VCs especially. The war times are important for us to remember. We must never forget the sacrifice made for our freedom. A great memorial, we will never forget them. Excellent, the military exhibits were great, surprisingly filled with very interesting artefacts, especially for a small museum. An impressive and interesting museum, particularly the section on the Lancaster Regiment. Thank you very much for that information, I will now be able to fully identify John Hedley in the group portrait. You’ve been most helpful Peter, thank you. That gives me a place to start! Thank you so very much for the information that you sent and especially for the photograph of my father. It was such a wonderful surprise to see him and I am really grateful to you for all the time that you have spent on this. My sister and I are already planning a visit to the museum next year! Many thanks for your informative and very prompt reply, I should have realised how naive I was to think things would still be the same after all these years but a lot of us older ones live in nostalgia and past times. I look forward to visiting the museum in the very near future. Many thanks for your speedy response. You have been most helpful. I cant thank you enough for all your hard work, you have been very thorough but you have only confirmed what I have known all along. Thank you for this information. Very helpful and filled in some blanks. How stupid not to have given his name!!! We are most grateful for your time and attention and look forward to learning more about our father’s and grandfather’s history with the regiment. Thank you for your help and i will now start my search again with the right regiment. Thank you very much indeed for the detailed and very quick reply. It fills quite a lot of blank space in my searches, especially in relation to William Matthews. I shall most certainly use the link to make a donation, which I shall arrange tomorrow. Hello and thank you very much for this information, it is indeed a great help and very much appreciated. Thank you so much for this. We did enjoy our visit to the Museum last week. You have added to our knowledge about Alfred in that he ‘died of wounds’, which so many sadly did in that chaos. We hope to visit again and purchase the history that you mentioned. Our thanks again. I really don’t know how to thank you enough for this information. I will progress and digest everything. Really, really, kind of you, thanks again. Thank you very much for your comprehensive reply. I will look into these and get my students doing some research too. Many thanks for the information. It confirms service in India and Sudan. The photos are excellent and we will see if there is anything that is familiar. Thank you very much for the links and information regarding your collection of sweetheart brooches and advertisements. These will be very helpful in my research and I hope I may contact you again about the collection if necessary. Of course we completely understand that you must be incredibly busy, and I know that there are many pressures on museums nowadays. We’d like to wish you good luck in your endeavours, and thank you again for the fascinating information that you’ve shared with us about Thomas Leach. Many thanks for your reply. You may be interested to know the reason behind my enquiry. I have been interested in the history and development of the limerick verse form for many years. The young lady of Riga is a particular favourite. I am in the process of finishing a book which is devoted entirely to the origins of this verse, its variants, its use as an analogy, and so on and so forth. Thank you for replying so promptly to my enquiry. Thanks for the info and I have donated and will do in the future from time to time.